Typically found on high-end cars, the sophisticated 6-speed EcoShift® and 7-speed Dual Clutch Transmissions (DCT) with steering-wheel-mounted paddle shifters incorporate the latest technology while delivering smooth and efficient power. You also have the option of an enthusiast-focused 6-speed manual transmission that’s fun to drive and puts you in total control at all times. At the core of the Veloster Turbo R-Spec are features that put you in touch with the road and maximize vehicle performance. The 201-hp twin-scroll turbocharged engine is at the top of a features list that includes a B&M Racing® Sport Shifter and sport-tuned suspension with higher spring rates at each wheel. A modified front suspension, featuring gas-filled hydraulic monotube shock absorbers, delivers a sportier ride, while the Motor-Driven Power Steering (MDPS) has been tuned for increased steering response. A large front stabilizer bar reduces body roll and improves handling and control on the curves. When the road turns twisty and you want improved performance in the corners, Torque Vectoring Control (TVC) enhances vehicle stability and safety. It’s standard on Turbo and uses the Electronic Stability Control (ESC) sensors to detect understeer then initiates specifically programmed braking to provide precise cornering without compromising driving dynamics. Get used to the spotlight. An aggressive front grille, flanked by distinctive LED headlight accents and a beveled hood gives Veloster a look that sets it apart from the competition. 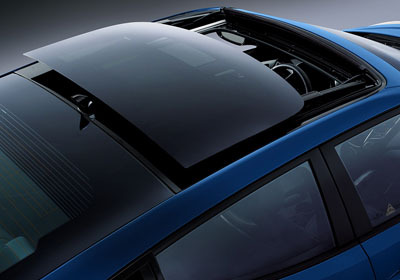 The available panoramic sunroof improves your view to the top. With the touch of a finger, transform the comfortable cabin and fill it with air, energy and light. When it comes to the exhaust, performance and style work hand-in-hand to provide a signature look. 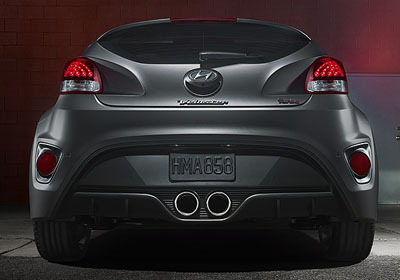 The Veloster has squared, chrome-tipped dual exhaust, while the Veloster Turbo distinguishes itself with centered round exhaust ports. Whenever you head off on another adventure, you’ll find yourself leaving the crowd, and an impression, behind. Some people were just meant for the big screen. Access all of your information and entertainment options via Veloster’s standard multimedia LCD touchscreen that measures 7 inches with rearview camera. Newly designed seats for the Turbo and Rally Edition feature larger bolsters with Turbo embossing. Contrast stitching for the Turbo and Rally Edition accent the seats, head rests, door armrests, center armrest and steering wheel. All-new black seats with yellow inserts and yellow accent stitching are available on non-turbo Velosters depending on the exterior color selected. Veloster offers an all-new available navigation system with Siri® integration for iPhone® users. Its other key features include a multi-touch screen with menu swipe functions and user-customizable folders for your favorite functions. This new system also supports downloadable and pre-installed apps and offers advanced voice recognition with simplified commands and better feedback for users via an enhanced microphone. When you’re carrying its high-tech key, Veloster will recognize you and unlock the vehicle with the push of a button on the driver’s door. Once in the driver seat, one touch of the push button start brings the Gasoline Direct Injection (GDI) engine to life. Even our take on safety is extreme. Six airbags with a front Occupant Classification System (OCS), high tensile strength steel and a sophisticated Vehicle Stability Management (VSM) system are all standard on Veloster. It‘s well above the average safety standard but then again there’s nothing standard about our commitment to safety. Make the most of your own personal safety features: your eyes and ears. When you engage reverse gear, the standard rearview camera sends a live feed to the 7-inch touchscreen in the center console. 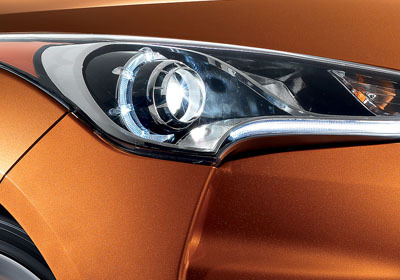 Superimposed guides aid in backing up while available warning sensors sound to help you avoid obstacles. Emergency braking maneuvers can cause wheels to lock up and skid, resulting in a loss of steering control exactly when you need it most. The Anti-lock Braking System (ABS) helps prevent the possibility of wheel lockup under hard braking, and rapidly pulses the brakes to help you retain steering control as you come to a stop. Enabling the driver to maintain confident control in difficult braking situations, Electronic Brake-force Distribution (EBD) helps balance braking forces at each wheel of the vehicle depending on the weight of the passengers and cargo that the vehicle is carrying.